Welcome to the website of the Breast Oncology Service at Saitama Medical University International Medical Center. in breast surgery and treatment. 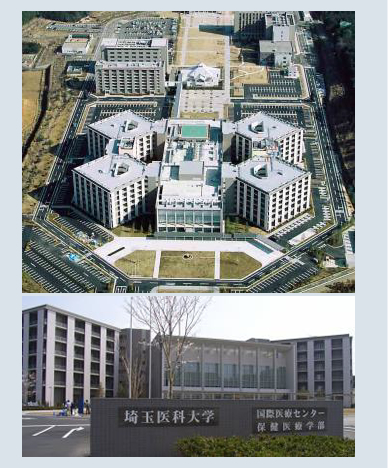 SMUIMC is a world-class academic medical center in Japan. The principle of SMUIMC is dedicated to patient-service first with aims similar to the Mayo Clinic in the United States. Opened in 2007, the over 700-bed medical facility offers a full scope of specialized care services, including a Cardiovascular Disease Center, Emergency Medical Center, and Comprehensive Cancer Center. It is the only private-sector hospital that has a Comprehensive Cancer Center. The Breast Oncology Service at SMUIMC specializes in women�fs breast health, offering world-class, state-of-the-art technology,and a well-trained, compassionate medical staff with knowledge of both surgery and medical oncology. Team members provide leading-edge treatment options, including breast-conserving surgery, reconstruction, systemic therapy, and partial breast irradiation in collaboration with plastic surgeons, radiation oncologists and medical oncologists. Our team also offers patients the most advanced diagnostic screening methods, including digital mammography, magnetic resonance imaging (MRI), and positron-emission tomography (PET). 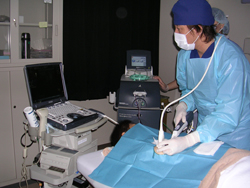 By emphasizing training and participating in clinical trials unavailable to the general public, Dr. Saeki and his staff achieve the best results by having leading-edge technology. 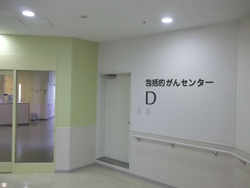 Specializing in all aspects of breast surgery and treatment, with a particular interest in medical oncology, Dr. Saeki is known internationally for his care of patients utilizing systemic therapy for breast cancer. He serves as Director of the Comprehensive Cancer Center and Vice-president of SMUIMC. 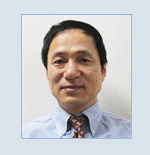 Specializing in all aspects of surgical oncology, Dr. Osaki is a prominent surgeon known internationally for his care of patients with breast cancer. 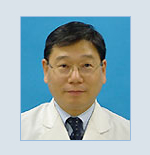 He serves as Professor of the Breast Oncology Service. 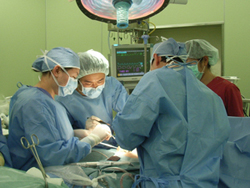 Our team performs approximately 500 surgeries of the breast each year. These consist of mastectomy or breast conserving surgery with sentinel node biopsy and/or axillary dissection if the node is positive. Breast surgeons also work in cooperation with plastic surgeons to offer a variety of types of breast reconstruction. Over 500 needle biopsies of the breast are performed each year. We are one of the leading facilities in the region that can perform stereotactic/ultrasound-guided vacuum-assisted biopsy (Mammotome®). The radiologists have interpreted thousands of imaging examinations, including MRI and FDG-PET. Breast imaging by ultrasonography and digital mammography is routinely available at the institute. The majority of patients who have breast cancer need chemotherapy and/or endocrine therapy. Our team consists of internationally known experts in breast oncology and utilizes a standard of care as well as new investigational agents. There are also ongoing clinical trials testing novel therapeutic approaches. Our support service �gYamabuki no kai�h was established in July 2007 and provides information and support to patients who have been affected by breast cancer. Our team is actively engaged in current, evidence-based medical education of breast surgery and treatment. �@Our education philosophy emphasizes equal parts of learning and teaching which provides significant exposure to a wide range of patients and career experiences for motivated students and young doctors. Our team offers rich opportunities for first-hand experience in clinical research and/or the laboratory and attendance at international conferences to present study results. We collaborate with several institutes in the United States and other countries. To add prognostic information, we are analyzing the feasibility to assess multigene assays (MammaPrint including Targetprint) on needle biopsies of the breast which may be cancerous. In addition, we started a joint exchange program in optical research with the Beckman Laser Institute and Medical Clinic at the University of California, Irvine, in May 2011. Optical technologies using Diffuse Optical Spectroscopy have been installed in our institute to promote developing non-invasive imaging systems which can allow for visualizing the function of breast cancer and monitoring tumor response to chemotherapy. MammaPrint: a diagnostic test to assess the prognostic risk of breast cancer patients based on the Amsterdam 70-gene breast cancer gene signature. Molecular imaging with FDG-PET, FMISO-PET, and FES-PET provide information of cancer glucose metabolism, hypoxia, estrogen receptor expression in the microenvironment. Optical imaging using Diffuse Optical Spectroscopy is useful to assess hemodynamic and physiological status in tissue. 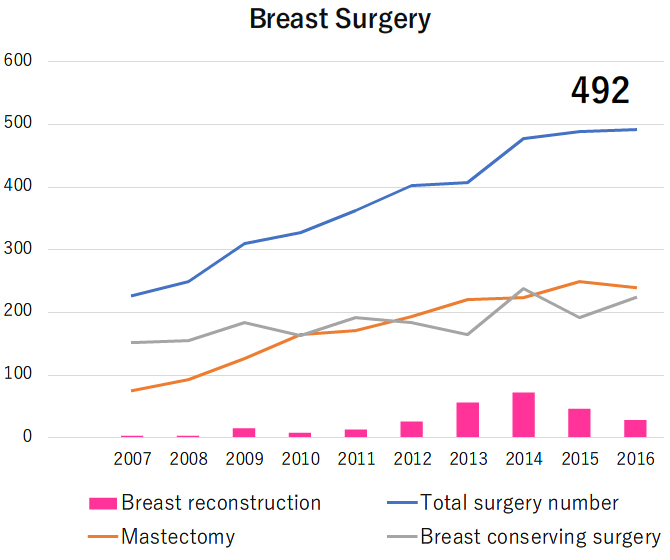 Ranked #5 in number of breast surgeries out of 835 hospitals specializing in breast cancer treatment. 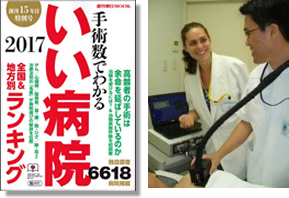 Ranked #3 of all university hospitals specializing in breast cancer treatment in Japan. Copyright (C) 2017 Saitama Medical University International Medical Center All Rights Reserved.